only mods folder into the jar file of SpawnChecker. I will install the (FML or) Minecraft Forge. Make sure that you launch the Minecraft once, (FML or) Forge is able to install. I’ll finish the Minecraft once. I will put on. Minecraft mods folder% appdata% , the jar file of SpawnChecker you downloaded. 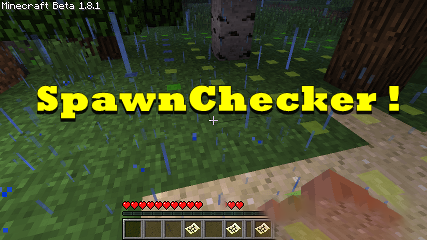 If you can verify that the start Minecraft, SpawnChecker is displayed in the list of Mod, it is successfully installed.
? If you have been introduced to our MOD past version, its ZIP file, please remove not forget.